To Cite: Ghassemi F, Ghanaati H, Karkhaneh R, Boujabadi L, ZiaTabatabaie S, et al. Outcome of Retinoblastoma Following Limited Sessions of Intra-Arterial Chemotherapy in Iran, Iran J Radiol. 2014 ; 11(3):e16958. doi: 10.5812/iranjradiol.16958. Background: The management of retinoblastoma remains a challenge to the multidisciplinary team, particularly as treatment affects not only visual outcomes, but also ocular retention and morbidity. Management of retinoblastoma has evolved over the past two decades. Objectives: To report the result of intra-ophthalmic artery chemotherapy (IAC) for the treatment of refractory and advanced retinoblastoma tumors. Patients and Methods: All patients who had failed to respond adequately to previous treatments and six naive patients with advanced retinoblastoma, receiving IAC between 2009 and 2012, were included in this institutional interventional case series. The patients received 1-2 treatments of IAC given 4-8 weeks apart. Complete response was defined as regressed tumor and complete disappearance of seeding clinically and partial response was defined as partial regression of the tumor with live parts of the tumor and/or lessening of seeds, but not complete disappearance of them clinically. Results: A total of 24 eyes of 24 patients were treated with IAC during the study period. The mean age at the time of IAC was 38.9 months (14-120 months), and the mean follow-up was 16.8 months (3-36 months) after IAC. Tumor control was achieved in 14 eyes (58.3%). Type 3 (combined fleshy and calcified remnants) was the most common type of regression (37.5%). Complications included vitreous hemorrhage in nine eyes (37.5%), arterial occlusion in two (8.3%), cyclitic membrane possibly secondary to ischemia and tractional retinal detachment in one patient (4.2%), chorioretinal atrophy in three (12.5%) patients, and neovascular glaucoma in one eye (4.2%). In eight (33.3%) patients, no complication happened. Globe salvage was achieved in 62.5% of the cases. The success rate for naive patients was 84%. Sixty-seven percent of the cases received transpupillary thermotherapy and cryotherapy before IAC. Conclusions: Intra-ophthalmic artery melphalan is an effective treatment for advanced cases of retinoblastoma, with a reasonable level of success. In the short follow up period of this study, it appears that the primary cases showed better results in the control of tumor. The management of retinoblastoma remains a challenge to the multidisciplinary team, particularly as treatment affects not only visual outcomes, but also ocular retention and morbidity. Management of retinoblastoma has evolved over the past two decades (1). Treatments available to the ocular oncologist include systemic or local chemotherapy (2, 3), laser (4), cryotherapy (5), external beam (6) or plaque radiotherapy (7), and enucleation (8). A recently popularized technique is the use of chemotherapy agents delivered directly into the ophthalmic artery (intra-ophthalmic artery chemotherapy; IAC). Infusion of IAC for retinoblastoma was previously explored in the 1950s by Reese et al. and in the 1960s by Kiribuchi (9, 10). Reese evaluated 31 children with retinoblastoma treated with internal carotid artery chemotherapy and radiotherapy and found this combination more effective than radiotherapy alone (9). In the recent years, Yamane et al. (11) offered the technique of selective ophthalmic artery infusion of chemotherapy for retinoblastoma and a new way was added to our armamentarium in the management of retinoblastoma (12). In 2008, Abramson et al. published their results of intraocular retinoblastoma response to superselective intraophthalmic artery chemotherapy (SSIOAC) that opened new doors for the management of these patients (13, 14). Since then, direct intra-arterial chemotherapy for retinoblastoma was proposed as an exciting approach that could represent as a primary alternative to systemic chemoreduction for retinoblastoma. This is the first report explaining our results using IAC in the treatment of retinoblastoma. In this report, we illustrate our recent experience and outcome of IAC in the treatment of retinoblastoma as a rescue therapy. In addition, we report some naive advanced cases of retinoblastoma patients receiving IAC. This study was a retrospective case series assessing the efficacy and complications of IAC in a consecutive series of patients with retinoblastoma. Approval was obtained from the institutional review board. The medical records of all patients with retinoblastoma treated by IAC in the Oncology Service at Farabi Hospital, Tehran University of Medical Sciences from June 2009 through September 2012 were reviewed. This report is the primary results of this procedure in advanced retinoblastoma cases in this center. Inclusion criteria for the use of IAC included those patients aged 4 months or older in whom the only other options would be enucleation and external beam radiotherapy. In 18 cases, IAC was given as the secondary treatment for those cases that were not controlled by other techniques of treatment and in six cases, IAC was the first treatment given. Parents were informed of the potential risks of ophthalmic artery cannulations (brain or orbital hemorrhage, infection, any inflammation, visual loss, loss of the eye, anaphylaxis, stroke, and unknown side effects) and a signed informed consent was obtained. On the initial visit, data were reviewed for demographic and clinical findings. Each patient was evaluated, regarding familial or sporadic pattern, overall tumor growth pattern (endophytic, exophyhtic and combine), tumor volume per eye, international classification of retinoblastoma, intraocular pressure, and status of the anterior chamber, iris, ciliary body, optic nerve, choroid, and vitreous. Patients received 1-2 treatments of IAC given 4-8 weeks apart according to the response to treatment in the ocular examination. An examination under anesthesia (EUA) was performed 3-4 weeks after IAC as before the treatment, and fluorescein angiograms were not routinely performed. The tumor sizes were measured clinically and by echography. The regression was encountered if all the tumors in the eye were regressed. All previous treatments to the eye and systemic chemotherapy or local treatments were recorded. All findings were documented by details on a fundus drawing, fundus photography with retcam (Massie Industries, Dublin, CA), and ultrasonography. The chemotherapeutic agents used in the protocol included melphalan (5 mg) in all cases. Topotecan (o.6 mg) and carboplatin (20 mg) were added to the protocol in some cases if the tumor was larger than 5×5×5 mm or extensive subretinal and vitreous seeding were present (6mm from the lesion margin). Selective delivery of chemotherapy in the eyes of children with retinoblastoma was performed as previously described (13-15). Each of the chemotherapy drugs was diluted with saline in a 10 mL solution and injected in a pulsatile route consecutively over 10 minutes for a total infusion time of 30 minutes when the three drugs were used. For the melphalan only protocol, the infusion was done in 30 minutes in 30 mL saline. Complete response was defined as tumor regression and complete disappearance of seeding clinically and partial response was defined as partial regression of the tumor with live parts of the tumor and/or lessening of seeds, but not complete disappearance of them clinically. Retinal function was assessed nearly in all patients if possible using a modified international society for clinical electrophysiology of vision standard electroretinogram (ERG) protocol, as described previously (16). Eye survival was defined as eyes salvaged without enucleation or external beam radiotherapy. At each examination under anesthesia, the individual tumor response was evaluated. Basal dimension and thickness of the tumor (in millimeters), regression pattern of the tumor, status of vitreous and subretinal seeds, and the status of the retina and subretinal fluid were recorded. Of 24 consecutive eyes in 24 patients with retinoblastoma treated with IAC, the mean age at the time of first diagnosis was 20.2 (0.5-60) months and at the time of IAC it was 38.9 (14-120) months. The patients included 22 Iranian, 1 Iraqi and 1 Azeri patient. There were 14 boys (59.9%) and 10 girls (41.6%). The disease was unilateral in 14 (58.3%), bilateral in 10 (41.7%), and familial in five (20.8%) patients at the time of diagnosis. IAC was performed as the primary treatment in six eyes (25%) and secondary treatment (after failed systemic chemotherapy or recurrences) in 18 (75%). All our six naive cases had unilateral involvement. Of the 18 secondary cases, four eyes (16.7%) had bilateral disease and two (8.3%) patients had an enucleation of the fellow eye (Figure 1). The eyes were classified as international classification of retinoblastoma group B (n= 1, 4.2%), group C (n = 2, 8.3%), group D (n =18, 75%), and group E (n = 3, 12.5%) at the first visit. On the initial examination, the mean tumor base was 14.4 mm (range, 2-21 mm), the mean thickness was 8.1 mm (range, 2.5-13 mm) and the mean volume was 1712.7 mm3 (range, 60-4788 mm3). There was a mean of 1.4 tumors per eye (range 1-7). Vitreous seeds were visible in 19 eyes (79.2%), subretinal seeds in 10 (41.7%), anterior chamber seeds in two (8.3%), subretinal fluid in 19 (79.2%), cataract in two (8.3%), feeding vessels in 19 (79.2%), iris neovascularization in one (4.2%), and neovascular glaucoma in none. The mean follow-up was 17.6 months (median, 14.6; range, 3-57 months) after IAC. Each patient was visited every month until complete regression. A. A calcified tumor in the nasal part of the fundus with a prominent vessel. B. The response of treatment after one IAC with melphalan (3 months). C. Another patient with a tumor (group D). D. The complete response of the tumor with lessening of the vitreous seeds and resulted chorioretinal atrophy and severe choroidal atrophy. This patient had severe diffuse arteriolitis the week after IAC that lasted more than 1 month. Of the 24 eyes treated, 15 had one cycle and nine had two cycles Table 1 We had eight unsuccessful cannulations, three in the first try and the five remainder cases in the second treatment. This was due to very narrow artery orifices and reported occluded arteries. The patients with failure of the first cannulation were not included in this study. Tumor response was complete in 14 (58.3%), partial in eight (33.3%), and two eyes (8.4%) showed no response. Three eyes (12.3%) showed partial response and secondary recurrence. Of the 19 regressed tumors, type 1 regression occurred in two eyes (8.3%), type 2 in six eyes (25%), type 3 in nine eyes (37.5%) and type 4 regression in two eyes (8.3%). No regression happened in one eye (4.2%) and in one patient, the follow-up was not enough for exact conclusion. In three eyes, the vitreous hemorrhage precluded fundus examination, but by ultrasound examination, the lesion appeared to have a calcified part and a small soft tissue part (type 3). These cases had no known hemorrhagic diathesis. Before IAC, the tumor diameter was 15.5mm (range, 4.5-60mm), the thickness was 5.4mm (range, 1-13 mm) and the volume was 951.8 mm3 (range, 41.25-4788 mm3). After IAC, the main tumor decreased to a mean base of 10.8 mm (range, 0-35 mm), mean thickness of 5.4 mm (range, 0-14 mm), and a mean volume of 621.3 mm3 (range, 0-4620 mm3). Overall, a mean of 69.7% decrease in the base, no decrease in thickness (some lesions had more thickness and some less and some were even flat), and 65.3% decrease in volume was noted at 2-3 months. Of the patients with vitreous seeding, response was complete in six eyes (25%), partial response in nine (37.5%), and no response in five (20.8%) and the evaluation of response was not possible in four eyes (16.7%), three with vitreous hemorrhage and one with inadequate follow-up. The vitreous hemorrhage never cleared sufficiently for the response to be assessed. By using additional transpupillary thermotherapy (TTT) and cryotherapy, 16 (66.7%) of the cases regressed completely and in six eyes (25%), because of incomplete response or recurrence, the second IAC was performed. TTT and cryotherapy was used for type 3 and 2 regressions according to the place of residual tumors. Of the enucleated eyes, eight had poorly differentiated types of retinoblastoma and one had the well-differentiated type. 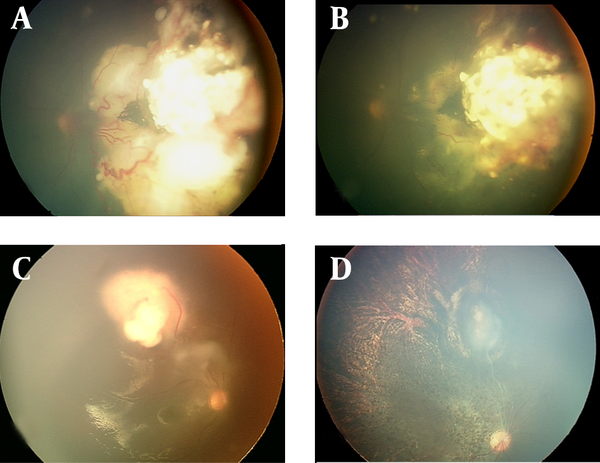 During a mean follow-up period of 17.3 months in this study, recurrence of intraretinal tumor was noted in 12 (50%); as a new tumor in nine (37.5%), subretinal seeds in one (4.2%), vitreous/anterior chamber seeds in two (8.3%) and new tumor and vitreous seeds in seven cases (29.2%). Eight eyes (33%) were enucleated for reasons of recurrent solid tumor (n =5, 21%), partial response to incompletely controlled tumor (n =7, 28.8%), massive vitreous hemorrhage (n =2, 8.5%), neovascular glaucoma (n =1, 4.2%), phthisis (n =1, 4.2%) and recurrent anterior chamber/vitreous seeds (n =2, 8.5% each). Some patients had more than one reason for enucleation. Overall, globe salvage was achieved in 15 eyes (62.5%) (Table 2). Complications after IAC included vitreous hemorrhage in nine eyes (37.5%), preretinal hemorrhage in three (12.5%), subretinal hemorrhage in one (4.2%) with later tractional retinal detachment, arterial occlusion in two (8.3%), phthisic eye in two (8.3%), cyclitic membrane possibly secondary to extensive vascular occlusion and tractional retinal detachment in one patient (4.2%) that resulted in phthisis, total hyphema and vitreous hemorrhage in one eye (4.2%), chorioretinal atrophy in three (12.5%) eyes, ptosis in two eyes, three eyes (4.2%) with retinal detachment, and NVG in one eye (4.2%). In eight (33.3%) patients, no complication happened. Persistent moderate ptosis occurred in two eyes (8.3), iris atrophy on the nasal side occurred in one patient (4.2%) who had central retinal artery occlusion (CRAO) and severe choroidal atrophy. No patients developed extraocular extension, femoral artery occlusion, stroke, any neurologic insult or sign of systemic metastasis, and no patients needed blood transfusion. Neutropenia happened in less than 10% of our cases in routine complete blood counts. No fever, septicemia and other systemic toxic effects were detected. In our series, seven patients accomplished their usual protocol of pre- and post-IAC electroretinograms (ERG). In two patients, the ERG was flat and unchanged after IAC. In two patients, the nearly flat pre-IAC ERG did not change. In one case, the ERG was normal before and after IAC. In one, the normal pre-IAC ERG showed significant decrease in amplitude because of the resulted severe arteriolitis. In the last one, the flat ERG response improved in amplitude after IAC. Intra-arterial chemotherapy is emerging as an exciting modality in our armamentarium against resistant cases and more advanced retinoblastomas. In recent years, specialized centers worldwide have used IAC and reported on their own experiences. The modality has been successful in experienced hands and some have reported dramatic declines in the number of enucleations performed. Despite the fact that systemic chemotherapy alone rarely (if ever) cures solid tumors in children and despite the fact that systemic chemotherapy alone rarely cures intraocular retinoblastoma, a significant number of the eyes treated with IAC are cured with chemotherapy alone (9). Previous reports have stated the efficacy and the safety of this approach (13, 14, 17). In our cases, 18 eyes had extensive previous treatments (including systemic chemotherapy, laser therapy, and cryotherapy), and in six cases, the intra-arterial chemotherapy was the first treatment approach. Globe salvage was achieved in 62.5% of our cases. The success rate for the naive group was 84%. For secondary IAC, the success rate was 56% and two eyes that needed enucleation after IAC were in group C at the time of diagnosis, but they were enucleated as the result of recurrence of new tumors and failure to respond to IAC. Overall, for group D and E disease, the success rate of IAC was 67.5% in this study. Abramson et al. reported good response in seven out of ten patients after IAC (13). Muen et al. reported excellent rates of tumor control in 15 cases (80%) with IAC and adjuvant therapy (18). In a study conducted by Shields et al., IAC led to globe salvage in 67% of the eyes. Eyes classified as group C or D showed 100% globe salvage, whereas group E had 33% of salvage. Of the four eyes managed with IAC as secondary treatment, globe savages were achieved in 50% in their study (19). Peterson et al. described outcomes in 17 eyes with international classification of retinoblastoma (ICRB) group D and Reese-Ellsworth group Vb disease; 76% of the tumors responded to IAC (20). These findings appear more successful than the results from systemic intravenous chemoreduction, whereby success (globe salvage and avoidance of external beam radiotherapy) was achieved in 90% of group C eyes and 44% of group D eyes (21). Our results are in accordance with previous results in that the type of regression was mostly type III (partially calcified) following IAC, similar to regression patterns found following chemoreduction (22, 23). In this study, a prominent change was seen at the base of the tumors, but the thickness of the tumors was not significantly changed. Group E eyes showed failure that required enucleation in 67% for reasons shown in Table 1 As opposed, chemoreduction alone has been shown to provide tumor control in only 25% of group E eyes, but this was improved to 83% of the control if prophylactic low-dose external beam radiotherapy was additionally given (22). Of the patients with vitreous seeding, response was complete in six eyes (25%), partial response in nine eyes (37.5%), and no response in five eyes (20.8%) and not evaluable in four eyes (16.7%). In a previous report by Shields, of the nine eyes with vitreous seeds on the initial visit, complete response was achieved in six eyes (67%), partial response was found in two eyes (22%), and recurrence was observed in one eye (11%) (19). It appears that incomplete entrance of chemotherapeutic agents through the blood-retinal barrier to the vitreous cavity precluded proper response of vitreous seeding. We had a patient with anterior chamber seeding who showed complete initial response, but later recurrence (in one month) happened with ultimate enucleation. In the first report by Abramson, the only adverse ophthalmic findings were occasional transient lid edema, forehead hyperemia, and loss of nasal lashes(13). However, they had other more serious complications including femoral artery occlusion in the first week and leukopenia in fewer than 10%, and severe ocular complications that consisted with avascular retinopathies resulting in blindness in 8.7% (15). Muen et al. found a number of side effects, in particular third nerve palsies, orbital edema, retinal detachments, and retinal pigmentary epithelium (RPE) damage. They noted damage to the RPE in 47% (18). In our cases, we did not see any case of third nerve palsy (Table 2). The mechanism of RPE damage remains to be determined, but it may be from direct cell cytotoxicity or vascular occlusion in the choroid or retina. In some cases, we were able to use fluorescein angiography, which showed delayed capillary perfusion without evidence of retinal arterial, venous, or capillary occlusions. We observed two cases (8.3%) of CRAO and a single case of severe diffuse arteriolitis (4.2%) in our series. Liu et al. reported eyelid edema and blepharoptosis after IAC as the main complication.The incidence was 18% and 9% for one cycle; 29% and 21% for two cycles; and 100% both for three cycles (24). Shields reported that following therapy, orbital and adnexal findings at 1 month included eyelid edema (n = 13), blepharoptosis (n = 10), cilia loss (n = 1), and orbital congestion with temporary dysmotility (n = 12). These findings resolved within 6 months in all cases(18). Following therapy, vascular findings included ophthalmic artery stenosis, confirmed on fluoroscopy in three cases. Concomitant central or branch retinal artery occlusion was noted. Subtle retinal pigment epithelial mottling was noted in nine cases that slowly evolved to later-onset underlying choroidal atrophy in five cases (25). In Muen’s series, sector choroidal atrophy was a particular concern in 15% of the cases (18). Wilson et al. reported acute ocular vascular toxicities during IAC in nonhuman primates. Of the 18 procedures, retinal artery sheathing was found in 94%, and retinal artery precipitates were seen in 56%; choroidal hypoperfusion was seen by a fluorescein angiogram in 100%, specifically with regard to acute vascular toxicities, drug concentration, pH, and particulates (26). The pathogenesis of the vascular insult was suggested to be due to catheter related injury to the endothelium, chemotherapy agent cytotoxic reaction to the endothelium, PH toxic effects on the vessel or specifically the endothelium, or embolization from foreign body contamination or chemotherapy precipitation (25). There were no clinically visible emboli in any cases, but narrowing of the arteries with sclerotic changes was documented (25). Eagle et al. showed that the most disturbing finding in their report of histologic findings of enucleated cases was the presence of intravascular foreign material within thrombi in five of the eight cases, presumably gained access to the eye or orbital tissue during administration of the IAC (25). Unlike the experiences of Shields et al. in seeing no ophthalmic, retinal, or choroidal ischemia after intravenous chemoreduction in more than 500 children, we saw few cases (four eyes) of branch retinal arterial occlusion specially in the quadrant of tumor location in the 200 treated retinoblastoma cases. In addition to the observed complications, some scientists have explained the cumulative radiation exposure during fluoroscopy with potential risk of toxic effects (25, 27). Brodie et al. showed good preservation of retinal function after this method of treatment with preservation or recovery of ERG measurements post-IAC treatment (16). In our series, we saw different kinds of ERG changes. The most severe changes in ERG were seen in those patients with occlusion of the central retinal artery and severe chorio-retinal atrophy. This study suffered from the small sample size and the retrospective nature of the study. Longer follow-up is necessary to document the specific visual acuity results in these young preverbal infants. Our series shows promising results of IAC for treating advanced retinoblastoma cases as a primary and secondary treatment. Despite several issues including vascular injury or toxic effects and end-organ ischemia, the favorable results in preserving globes are notable. However, when faced with the possibility of an enucleation or external beam radiation therapy for example in monocular cases, the ocular complications are less of a concern. More attempts should be made to improve the future of this treatment and limiting possible post treatment complications. Financial Disclosure: We are pleased to report no financial disclosures by any of the authors of this paper. Funding/Support: This study was partially supported by the Research Deputy of Tehran University of Medical Sciences.